The great part about these five food items– besides obvious mouth-watering side effects– is that in explaining the characters components, Eva showed me how meaning is built in Chinese from each character being put together with other ones. Sausage literally consists of the characters that mean “fragrant intestine” (香 xiang 腸 chang). Then, Eva’s preferred filling of basil is built from the characters that mean “nine layer tower” (九層塔 jiu ceng ta), which refers directly to the way the basil plant grows: in many layers stalked around a thin stalk, like a tower. Isn’t that awesome? As a writer and general language geek, I think it’s wicked cool!! Although I hope to avoid writing very bad Chinese-character-inspired poetry, these fascinating etymologies will help me to remember how to write characters and recognize character patterns better. Instead of sounding out words phonetically like I did when learning to read English, I can try to “meaning-out” the word and build its meaning from the connotations of each character within it, though I don’t know the idiomatic nuances yet. Have you ever found in a foreign language a literal translation or an idiom that made you laugh, or start to think harder about that language? 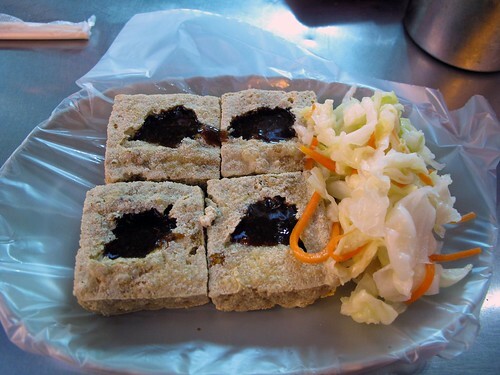 Perhaps made you feel like an “empty heart vegetable,” or a “stinky bean decay” (stinky tofu)? Full disclosure here: I went to my first Night Market at Tong Hua last night, and dined happily on both of the above items. I’m a huge fan– and despite my better judgment, still want to write an ode to the empty heart vegetable and a sonnet to stinky tofu! Empty heart soup is a new favorite phrase. Can’t wait to read about more neat language discoveries! Chinese truly sounds like a fascinating (and complicated!) language, but it seems as though you are making progress already! I remember being most amused by Italian translations of English movie titles. One of my favorites was Dead Poet’s Society, which became “L’attimo fuggenti”: “the fleeting moment.” Very poetic!